First Time Clients Receive 50 Minute Massage for $59 or Facial For Only $64. We provide caring, holistic wellness services for our clients. Learn more about all the services we provide. Our client forms are available online so they can be completed in the convenience of your own home of office. Instant Gift Certificates are available online! Buy one now! Organic Spa & Wellness Services for All! 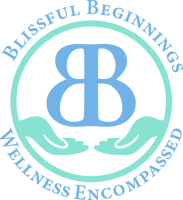 Blissful Beginnings and Beyond's mission is to introduce and educate individuals and companies on the long term benefits of alternative health care programs, such as therapeutic massage and bodywork, meditation and movement, self-massage and natural health care products. We assist individuals by listening to them and offering them a customized program to enhance their overall well being, providing natural, restorative treatments for mind, body and spirit. We are with you from the beginning of your pregnancy and beyond, nurturing you and Dad, Partner, or Family Member as you begin a new family. We offer you the finest holistic wellness and spa services at your home or our facility in Southampton, PA as well as in the hospital of your choice. In some cases flexible spending or health services accounts may cover your massage therapy sessions. Blissful Beginnings & Beyond services the following counties: Bucks, Montgomery, Philadelphia, Delaware, Chester, and Berks. Wellness Encompassed serves PA, NJ & DE with on-site Corporate Wellness Services with fully licensed and experienced professionals. "Blissful Beginnings and Beyond is the best at what they do and make you feel right at home." "Susan Shaw at Blissful Beginnings and Beyond is the real deal. If you want a therapeutic massage that gets results and leaves you feeling like a new person then I am sharing one of my best kept secrets! I never ever write reviews. Good or bad. If I am happy with a service I go back and stay loyal. I only hesitate to write this in fear that she will be so busy I won't be able to book her. So here it is... I can only say she is simply the best." "Karen complained of sinus pain and swelling on right cheek, especially painful when smiling. She had sinus surgery a few years ago and since then has been suffering with pain from scar tissue and swelling. She received 2 Lymphatic Enhancement Therapy treatments, concentrating on the face and sinus cavities. After 1st session, she commented “I am feeling good and I’m definitely doing it again.”"
"Jacqui complained of neuroma pain in right foot and also wanted to experience Lymphatic Enhancement therapy for facial toning and rejuvenation. After her 2nd treatment, she saw a smoother, glowing skin. The neuroma on the right foot was very painful and after the 2nd treatment, she is pain free and didn’t need surgery. She would highly recommend this treatment for pain relief and facial rejuvenation!" "Adam presented with vertebral fractures of the spine this summer, leading to edema and dermatitis of the legs. After 1 Lymphatic Enhancement Therapy session, Adam was able to slip his feet into his sneakers without assistance; leg edema reduced and Adam felt less pain. After 6 sessions, Adam’s legs were back to normal size." Stylist Lee is dedicated to consistently providing high customer satisfaction by rendering excellent service, quality products, and furnishing an enjoyable atmosphere. John is a lifelong California resident and has always had a passion for hair. She achieved her training at Paul Mitchell the School in Sant Monica, CA.